On the evening of Sunday, September 30, 1962, Southern segregationistsrioted and fought state and federal forces on the campus of the University of Mississippi (Ole Miss) in Oxford, Mississippi to prevent the enrollment of the first African American student to attend the university, James Meredith, a U.S. military veteran. President John F. Kennedy had sent federal marshals to Oxford on Saturday, September 29, 1962 to prepare for protests he knew would arise from Meredith’s arrival and enrollment. While this occurred, Mississippi Governor Ross Barnett, a publicly avowed segregationist, spoke at an Ole Miss football game encouraging action on campus to block Meredith’s entry into the university. The next day, Meredith was escorted by Mississippi Highway Patrol as he made his way to the campus to move into his dorm room. He was greeted by 500 federal marshals assigned for his protection. Thousands of rioters from across the South gathered that evening at Ole Miss. The highway patrol tried to push back the crowd, but were dismissed by Mississippi Senator George Yarbrough at around 7:25 p.m. The crowd increased rapidly, and a full riot broke out at 7:30 p.m. The crowd reached approximately three thousand rioters, led by former Army Major General Edwin Walker, who had recently been forced to retire when he was ordered to stop giving out racist hate literature to his troops but refused to do so. The crowd consisted of high school and college students, Ku Klux Klan members, Oxford residents, and people from outside the area. By 9:00 p.m. the riot turned extremely violent. U.S. marshals who had been defending Meredith and university officials in the Lyceum building on campus, where Meredith registered, ran out of tear gas. Rioters threw rocks and bottles and began to shoot. President Kennedy then decided to bring in the Mississippi National Guard and Army troops from Memphis, Tennessee, during the middle of the night, led by Brigadier General Charles Billingslea. Before their arrival, rioters learned of Meredith’s dorm hall, Baxter Hall, and began to attack it. When Billingslea and his men arrived, a white mob set his car on fire while he, the Deputy Commanding General John Corley, and aide Captain Harold Lyon were still inside. The three were able to escape but were forced to crawl 200 yards through gunfire from the mob to get to the Lyceum building. To try and keep control of the crowds, Billingslea created a sequence of secret code words to signal for first, when to issue ammunition to the platoons, second when to issue it to the squads, and finally when to load. None of these could occur without the codes given by Billingslea. This resulted in one third of the Marshals, totaling 166 men, were injured in the mass fight and 40 soldiers and National Guardsmen wounded. Two men were murdered during the riot: French journalist Paul Guihard who was working for the Agence France-Presse, and 23-year-old Ray Gunter, a white jukebox repairman. In total, more than 300 people were injured. 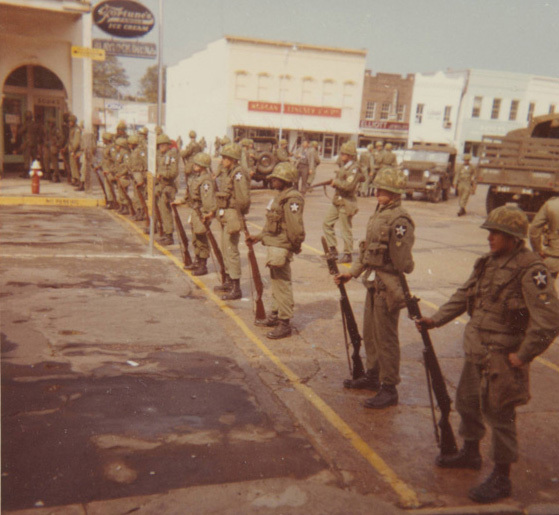 On October 1, 1962, the riot was suppressed with 3,000 soldiers stationed to occupy Oxford and the Ole Miss campus. Meredith, escorted by U.S. Marshals, attended his first class at Ole Miss, an American history course. “Integrating Ole Miss: A Transformative, Deadly Riot” by Debbie Elliott, National Public Radio (NPR), October 1, 2012, https://www.npr.org/2012/10/01/161573289/integrating-ole-miss-a-transformative-deadly-riot; “1962: James Meredith Integrates ‘Ole Miss (Sept – Oct), Veterans of the Civil Rights Movement, n.d., http://www.crmvet.org/tim/timhis62.htm#1962olmiss.